Summary: Phoebe is a factory girl who has come to Shanghai with the promise of a job - but when she arrives she discovers that the job doesn't exist. Gary is a country boy turned pop star who is spinning out of control. 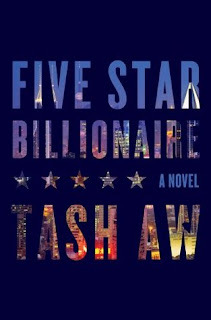 Justin is in Shanghai to expand his family's real-estate empire, only to find that he might not be up to the task. He has long harboured a crush on Yinghui, who has reinvented herself from a poetry-loving, left-wing activist to a successful Shanghai businesswoman. She is about to make a deal with the shadowy figure of Walter Chao, the five-star billionaire of the novel, who - with his secrets and his schemes - has a hand in the lives of each of the characters. All bring their dreams and hopes to Shanghai, the shining symbol of the New China, which, like the novel's characters, is constantly in flux and which plays its own fateful role in the lives of its inhabitants. Five Star Billionaire, the dazzling kaleidoscopic new novel by the award-winning writer Tash Aw, offers rare insight into China today, with its constant transformations and its promise of possibility.